It saw the rise of middle-class culture. A more broad audience for music. Harmony was notated with a figured bass. It allowed the performer to improvise chords. The bass section was played by a basso continuo and played by two musicians. A cello and a harpsichord usually. The Diatonic system of music was introduced. Major and Minor tonality. Early Baroque music moved freely, whilst later baroque music was regular rhythms and expansive melodies. As the complexity of instruments improved so did the musicians. The introduction of the Virtuoso. What was new about Baroque music at the beginning of the Baroque era? How did Baroque musicians bring Drama to music? 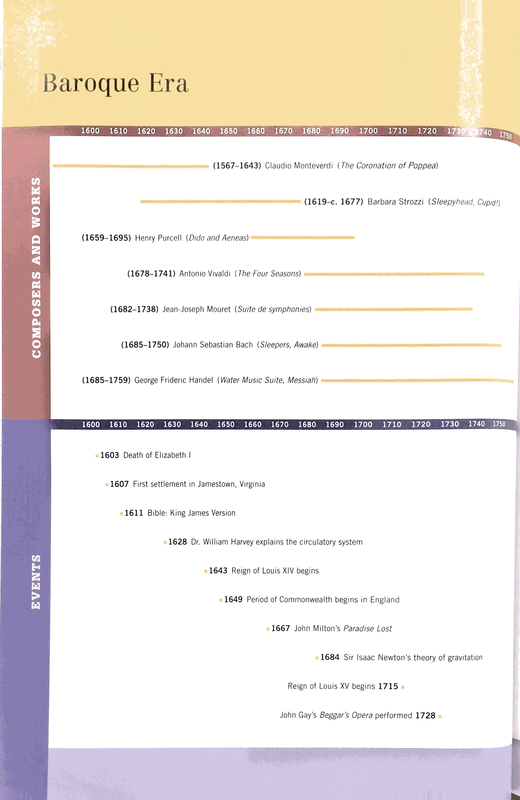 A basic music history timeline looks like this. It is basic and dull. But it highlights how we categorise the main musical periods. Your task is to make it more interesting by filling it with composers, significant works and moments in History that affected music. Make it colourful and bright. You will need this all through your course and you may want to add to it at a later date. A very brief outline of what will be studied over the course of the year.